WASHINGTON DC, May 16 2018 (IPS) - We are deeply disappointed by the counterproductive response from the Trump administration to the statements from senior Saudi officials threatening to pursue nuclear weapons in violation of their nonproliferation commitments. We call on the White House to immediately reiterate the longstanding, bipartisan policy of the United States that it will actively work against the spread of nuclear weapons to any country, friend or foe. President Donald Trump’s reckless decision to violate the Joint Comprehensive Plan of Action (JCPOA), which has blocked Iran’s pathways to nuclear weapons and put in place a robust monitoring system to detect and deter cheating, has not only opened the door to an expansion of Iran’s capability to produce bomb-grade nuclear material, but it has increased the risk of a wider nuclear arms race in the Middle East, which is already home to one nuclear-armed state. Saudi Arabia’s foreign minister Adel Al-Jubeir told CNN May 9, that his country, which, like Iran, is a party to the 1968 nuclear Nonproliferation Treaty (NPT), stands ready to build nuclear weapons if Iran restarts its nuclear program. Al-Jubeir also praised Trump’s decision to abandon the Iran nuclear deal and seek to reimpose sanctions on firms and business engaging in legitimate commerce with Iran. This follows similar comments by Saudi Crown Prince Mohammed bin Salman in a March 15 interview with CBS News that Saudi Arabia will quickly follow suit if Iran acquires nuclear weapons. “Right now, I don’t know that we have a specific policy announcement on that front, but I can tell you that we are very committed to making sure that Iran does not have nuclear weapons,” she stated. The administration’s nonresponse to Prince Salman’s threat in March and Sanders’ weak response May 9 amounts to an irresponsible invitation for mischief. They imply that Trump administration would look the other way if Saudi Arabia breaks its NPT commitments to pursue nuclear weapons. It is bad enough that the Trump administration, by violating the 2015 Joint Comprehensive Plan of Action, has threatened the NPT regime by opening the door for Iran to expand its nuclear capacity. President Trump and his advisors must not compound that error by swallowing their tongues when another NPT member state in the region threatens to pursue the bomb. We also call on the U.S. Congress to reject any proposed agreement with Saudi Arabia that permits U.S. nuclear cooperation if Saudi Arabia seeks to or acquires sensitive uranium enrichment or plutonium separation technology which can be used to produce nuclear weapons. Saudi nuclear options are also linked to Pakistan providing a nuclear umbrella, with some reports indicating that a few nuclear weapons might be at the Saudi disposal when required. 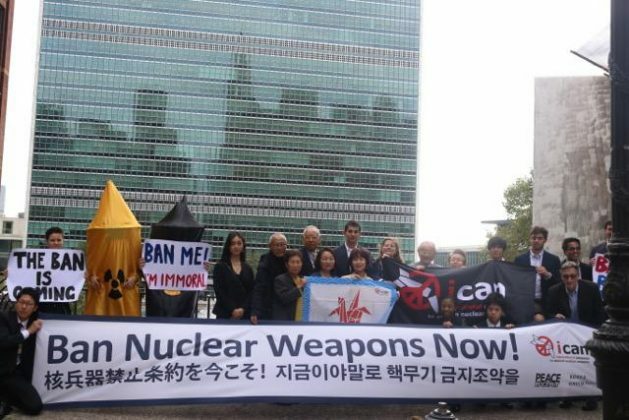 Deployment of US nuclear weapons in NATO and other countries in violation of the NPT has also set a bad example.